Wedgwood was founded in 1759 at the Ivy House Works, Burslem by Josiah Wedgwood, (1730-1795), who is now remembered as the "Father of English Potters". He was the youngest of 12 children born in Burslem, Staffordshire, in the heart of the English potteries and served his apprecticeship as a potter before setting up his own business. 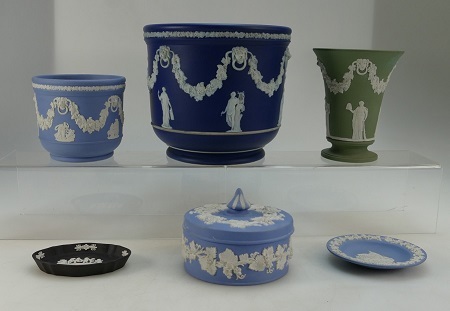 In 1765, Wedgwood created a new form of earthenware, which impressed the then British Queen consort Charlotte of Mecklenburg-Strelitz, who gave official permission to call it "Queen's Ware." In 1766, Wedgwood bought Etruria, a large Staffordshire estate, as both a home and factory site. Wedgwood developed a number of further industrial innovations for his company, notably a way of measuring kiln temperatures accurately and the new ware types Black Basalt and Jasper Ware. During the late Georgian period, the fame of the factory grew. Wedgwood was quick to respond to the latest fashions. Patterns harmonized with the elegant interior decoration of the time, and figures and vases were made in Jasper and Basalt. 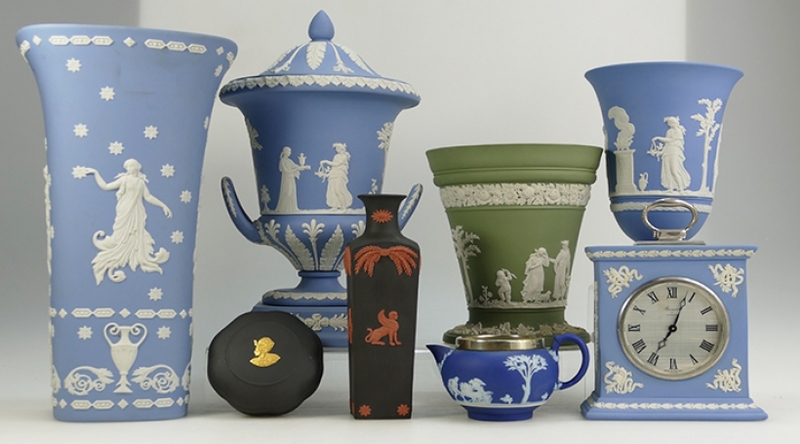 Wedgwood always took new shapes home for his wife to try out, before large-scale production began. In the early 19th century, bone china was made in limited quantities, but in the last 100 years it has been of growing importance in the factory production. Wedgwood's best known product is jasper ware created to look like ancient cameo glass. It was inspired by the Portland Vase, a Roman vessel which is now a museum piece. A first edition copy of the Portland Vase made in the late eighteenth century realised £20,000.00 at Sotheby’s on 30th November 1971 – a world record auction price for an English ceramic. 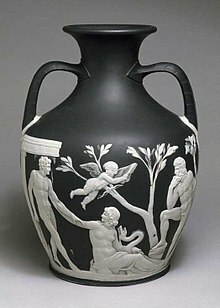 Josiah Wedgwood paid the third Duke of Portland £100, a handsome hiring fee in those days, for the loan of the Barberini (or Portland) vase in order to model his famous Jasper reproductions. As well as being a pioneer in the world of pottery, Josiah Wedgwood also held very strong beliefs and was an astute businessman. Josiah Wedgwood was an enthusiastic supporter of the American War of Independence, and worked against the slave trade. As a businessman he realised that items could be made to commemorate particular events. Jasperware proved very useful for this and Wedgwood continue to make event pieces. 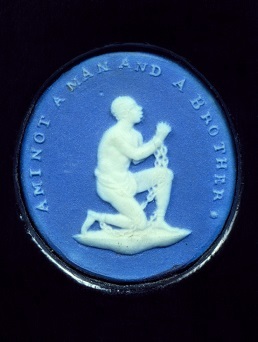 One famous earlier piece produced in 1787 was a medallion depicting a slave kneeling in chains with the inscription ‘Am I not a man and a brother?’ Thousands of these were freely distributed. During the early years, Wedgwood engaged famous artists of the day such as John Flaxman and George Stubbs. John Flaxman was 19 years old when he was employed in 1774 as an artist, and he continued to work for Wedgwood 12 years. The "Dancing Hours" may be his most well known design. 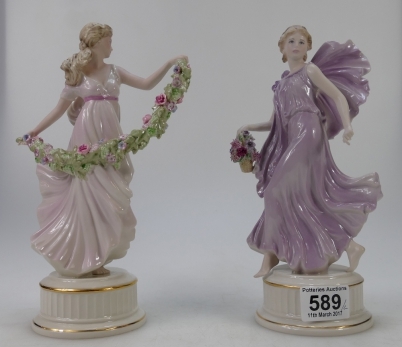 Lot 589 -Wedgwood limited edition figures The Dancing Hours CW237 and CW235 (2). Sale Price in March 2017 -£60.00. 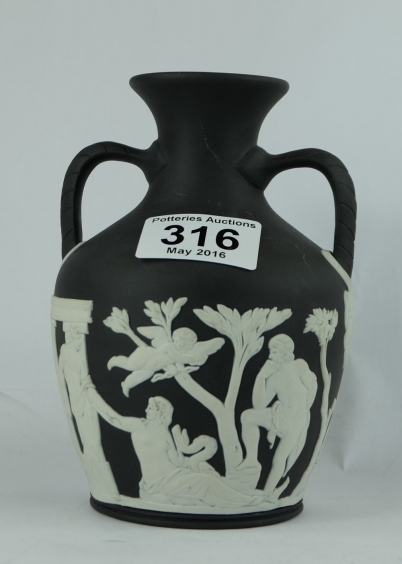 Lot 316 - Wedgwood Black small Portland vase, sold in our May 2016 sale for £150.00.